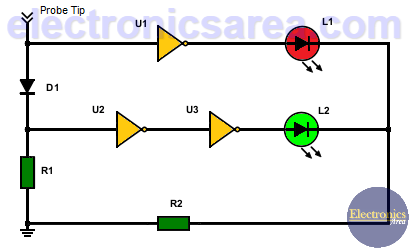 This very simple logic probe using NOT Gates (inverter gates) is made with three NOT gates, one rectifier diode, two LEDs and two resistors. 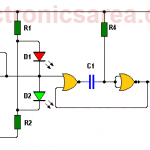 The logic probe allows us to know the logical state of any point in a digital circuit. The signal to be measured is applied to the “Probe Tip” input. How the logic probe works? The top NOT gate inverts the signal and the red LED is Off. The diode is directly polarized, the signal is inverted twice by the two cascaded NOT gates and the green LED lights up. The top NOT gate inverts the input signal and the red LED turns On. The diode is reverse polarized and does not conduct. As a consequence, at the diode anode there is a “logical low.” This “logical low” is inverted twice and the green LED does not light up. The R2 resistor limits the current flowing through both LED (green and red). To implement the circuit, a TTL SN7404 integrated circuit (6 NOT gates in a single IC) is needed. A 5 volts voltage source powers this circuit and can only be used to test digital circuits manufactured with TTL integrated circuits. 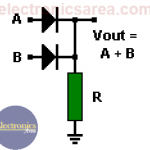 The ground connection (0 volts) of the circuit under test and the 0 volts terminal of the digital probe must be the same.